There's something very comforting about coming home to your cozy house after a hard day of work or school and making and eating breakfast foods. And in these days of rising prices, breakfast recipes are less expensive than traditional dinner recipes. Pancakes, waffles, egg, and cheese dishes are easy to make, use ingredients you most likely have on hand, and taste wonderful too. Plus, kids love the novelty of eating breakfast foods in the evening. You can even make many of these recipes ahead of time. Pancakes and waffles freeze well. It's easy to reheat waffles in the toaster or toaster oven, and pancakes thaw and reheat well in the microwave oven. You can also use your crockpot for egg dishes that cook all day and are ready for you when you get home. Classic pancakes are so easy to make. Just follow directions carefully, and measure carefully and you'll serve the best pancakes ever. This extra-special recipe is so easy because you can make all of the components ahead of time. Then just assemble and bake when you're ready to eat! I love the combination of textures and flavors in this recipe. Not only is this a wonderful and filling dish, but you make it before you leave for work. Then just pop it in the oven when you get home. It's like a souffle, but it has more substance. These light and fluffy pancakes are stuffed full of luscious blueberries. Look in your supermarket for different flavored syrups to serve with pancakes or waffles - blueberry would be wonderful! This huge pancake, which is really a big popover, bakes in the oven so everybody gets a fresh hot chunk of pancake at the same time. I think a fabulous dinner would be some simple scrambled eggs, a few spicy pork sausage patties, and this apple cobbler served warm from the crockpot. Try it! Make a couple of small omelets, then layer them with vegetables and salsa for a great breakfast/dinner entree. 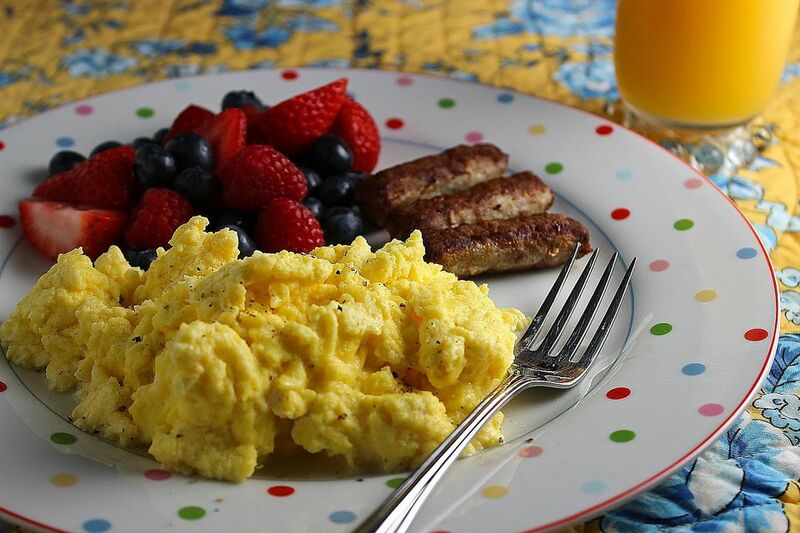 Fresh spinach wilts into hot, fluffy scrambled eggs for added color, flavor, and nutrition. Yum. A frittata is an excellent recipe for those who aren't quite confident enough to try an ethereal omelet. This recipe uses leftover cooked pasta to make a delicious dish. This crockpot recipe has it all! Eggs, hash brown potatoes, vegetables, and cheese cook all day to perfection and is ready when you are. Potatoes and eggs are a natural combination, and so delicious in this easy, savory omelet. When I was a teenager, recovering from just about any illness, I requested Swiss Eggs for my first meal as a healthy person. I love the combination of mustard, eggs, and cheese in this easy recipe. It's mild, but delicious and savory. What's odd is they are called 'Swiss' eggs, but there's no Swiss cheese in them! This easy casserole layers eggs with link sausages and cheddar cheese. It's really luscious. I love French Toast. Serve it with maple syrup, butter and powdered sugar (my personal favorite), or try a mixture of chopped tomatoes and some fresh herbs.